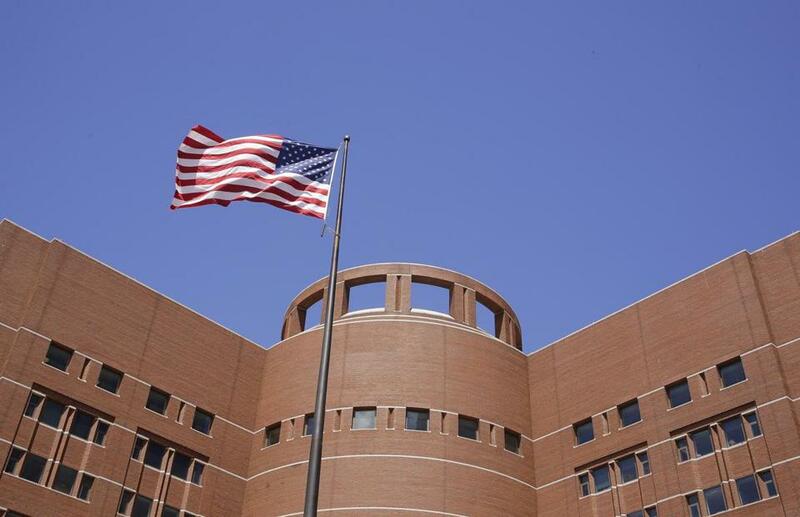 The federal courthouse in Boston. The suit seeks to block enforcement of the order. Additionally, the cities want the judge to declare that they are not violating any federal laws and therefore cannot be subjected to the penalties outlined by the Trump administration. “Sanctuary city” is a political term used to describe a municipality that declines by local ordinance to assist federal immigration authorities, under the belief it would cause immigrants to fear cooperating with local authorities, specifically police. But in his Jan. 25 executive order, Trump said municipalities that hinder federal immigration enforcement — in violation, in his view, of federal laws — would be stripped of federal financial assistance. The lawsuit filed by Lawrence and Chelsea in federal court seeks to block enforcement of the executive order. Opponents of the executive order argue that local governments should be able to enact rules that will help them build trust with their immigrant residents, without intrusion from the federal government or the threat of penalties. “This executive order comes in and unconstitutionally coerces [the municipalities] to use local resources in a way that is contrary to important principles of local control, and the local officials’ determination regarding what is best for their citizens, for the citizens of Chelsea and Lawrence,” said Inez Friedman-Boyce, a partner at Goodwin, an international law firm with offices in Boston. The firm is working with the Lawyers’ Committee for Civil Rights and Economic Justice to represent the two cities pro bono. “It’s an unconstitutional effort to commandeer local resources to do the job of the federal government,” she said. The lawsuit mirrors one filed last week by San Francisco, the first in the country. The Lawrence and Chelsea case is believed to be the first filed in the Northeast. The lawsuits come as immigrant rights advocates turn to the courts across the country, challenging Trump’s separate travel ban temporarily prohibiting refugees and immigrants from seven Muslim-majority nations from entering the country. A federal appeals court in San Francisco is considering whether to uphold a temporary restraining order halting the ban, after hearing arguments Tuesday. The president’s order penalizing sanctuary cities, issued in his first week in office, reflected his campaign promise to retool the immigration system. He has argued that sanctuary cities harbor illegal immigrants who “breed crime.” He has said that the defunding of cities could be a “weapon” he would use in immigration enforcement. Ambrosino said Wednesday that Trump’s orders have had a chilling effect on immigrant communities, while the purpose of a sanctuary city declaration is to make all residents feel welcome — and comfortable with the local authorities, specifically police. The lawsuit alleges the order fails to define a sanctuary city or how a local government would be flouting federal law, a violation of its due process rights against penalties, such as a loss of funding. The lawsuit also alleges the order infringes on states’ rights by seeking to force municipalities to participate in federal immigration enforcement. Lawrence, Chelsea, Boston, Cambridge, and others have enacted ordinances that call on law enforcement to build trust by not enforcing the civil immigration laws. In some cases, police are instructed not to inquire about immigration status. An officer could detain an illegal immigrant who has a warrant for a separate crime, but not for a civil immigration offense. The lawsuit argues that municipalities still comply with a federal law that requires them to share or receive the immigration status of people with federal authorities, but it does not require them to proactively enforce immigration laws. Espinoza-Madrigal said places like Chelsea and Lawrence, which he called gateway communities for immigrants and minorities, would be devastated by a loss of funding. Chelsea, for example, counts on the federal government for $14 million of its annual budget of $170 million, or about 8 percent. The city is 62 percent Latino, and 21 percent of its residents live below the poverty level; 44 percent were born outside of the United States. Lawrence counts on the federal government for $38 million of its $245 million annual budget, or more than 15 percent. The city is 74 percent Latino, and 28 percent live below the poverty line; 37 percent of its residents were born abroad. Friedman-Boyce acknowledged that in some cases the government can set standards for programs it funds, for instance for educational or research grants. But, she argued, the executive order goes too far, threatening to end funding for things like housing and education to coerce local governments.